People who cycle regularly not only enjoy the fitness levels of non-cyclists ten years their junior, but, on average, live several years longer too. They also suffer less from ill health and illness. In fact, research has shown cycling to be the most effective way to increase longevity. The Cheltenham cycle map is available to download from the Cheltenham & Tewkesbury Cycling Campaign website and shows the road network of Cheltenham, which is graded according to the degree of experience needed to cycle each route. Printed copies of the map can be obtained from the Municipal Offices and local tourist information offices. There is also a Cheltenham tourist cycle trail map available to download. 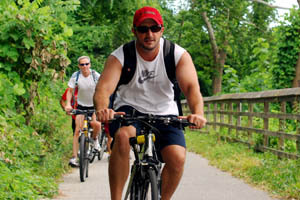 There are also many other cycle routes in Gloucestershire for you to explore and enjoy. View a map of all cycle parking areas in Cheltenham town centre. Cheltenham & County Cycling Club has over 250 members and welcomes all cyclists, male, female, young or old. The cyclists' touring club in Cheltenham consists of people from a large age range and a wide variety of backgrounds with the common interest of cycling. It's important to stay safe whilst on your bike. Follow these tips to ensure you have a safe trip.